At his downtown Chicago office in Northwestern Memorial Hospital, Dr. Sidle offers many non surgical options for the treatment of facial lines and wrinkles. Dr. Sidle can offer patients a non surgical facelift referred to as a “Liquid Facelift.” Dermal fillers or dermal injectables are indicated for the correction of facial lines, wrinkles, and folds to restore volume and fullness to the skin, providing a more youthful appearance. With the aging process, you will lose fat and lose collagen which will cause the facial tissues to descend down ward with gravity. Patients will notice a loss of volume to their cheeks, lower lids, and jaw line areas with more prominent folds and depressions around the mouth. Dermal fillers can replace the lost volume and stimulate new collagen production for a long lasting result. Facial injectables are available as temporary fillers, semi permanent fillers, and permanent fillers. Each dermal filler has its own properties and characteristics as well as optimal performance profile and longevity. Dr. Sidle offers Botox or Dysport, Restylane, Juvederm, Perlane, Radiesse, Sculptra, and Fat Grafting. Most people report that the injections are relatively painless and feel comfortable in resuming their normal activities immediately following treatment. Temporary puffiness of the treated areas, however, should be expected for the first few days. Hyaluronic Acid (Restylane®, Juvederm®, Perlane®) products are injectable agents that, like collagen, make up the ground substance or glue that acts as structural foundation for the skin. These materials have a history of safe and effective use in many countries around the world with a rapidly growing experience and booming popularity here in the U.S. No allergic reactions are expected for hyaluronic acid materials. A facelift surgery will provide a tighter, firmer, and fresher appearance but with a natural appearance. 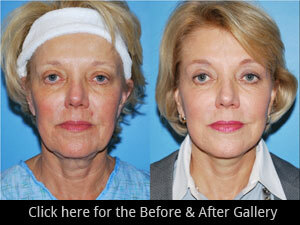 Facelift surgery results will provide you with a more youthful appearance but still looking like you. A facelift smoothes loose skin on the face and neck, tightens underlying tissues and removes excess fat. There are many varations to a facelift technique but in any approach, the goal is to keep the incisions hidden and concealed. The incisions are designed to keep the scars as inconspicuous as possible. The sagging muscles are tightened and the skin is re draped with a tighter, more firm appearance. A facelift surgery will restore a more youthful appearance by providing fuller cheeks, improving fullness and laxity to the jowls and loose skin on the front and side of the neck. Recovery period will typically take 10 days and some tightness and numbness will persist in the face and neck for a few weeks. Experience Matters. As a board certified Facial Plastic Surgeon at Northwestern with an expertise in the face and neck, Dr. Sidle can provide you with an individualized plan to achieve your goals of a more youthful face. Call our office for a one-on-one consultation. All post-operative instructions can be found on the Patient Resources page. Click Here to access our Before and After gallery of procedures.